The House of Representatives this afternoon declined to grant the president the authority to continue supporting the NATO mission in Libya, another sign of rebellion brewing thousands of miles away on Capitol Hill as NATO's bombing campaign in support of Libyan rebels enters its fourth month. Frustrated lawmakers from both parties, who later rejected a measure that would have limited funding, have threatened to cut off funding for U.S. operations there amid concerns about their cost and growing dissatisfaction with the Obama administration's skirting of the War Powers Resolution. With wide bipartisan opposition, a vote on a resolution sponsored by Rep. Alcee Hastings of Florida to authorize operations failed today 123-295, with 70 Democrats joining 225 Republicans in opposing authorization. Just eight Republicans and 115 Democrats voted to give the president the authority. Aside from granting the president power to wage operations in Libya for the next year, the resolution would have expressed opposition to U.S. ground forces "unless the purpose of the presence is limited to the immediate personal defense of United States Government officials (including diplomatic representatives) or to rescuing members of NATO forces from imminent danger." Finally, the measure declares that the president shall consult frequently with Congress regarding U.S. efforts in Libya. The War Powers Resolution requires the president to seek Congressional approval for its engagement there within 90 days of entering hostilities. That period has ended, so the president needed authorization, according to the law. White House and State Department lawyers have argued no approval from Congress is needed given the limited scope of U.S. involvement, which they do not consider hostilities. The House of Representatives also voted today on a second resolution related to Libya which have cut funding from operations, except for a few specific actions to support the NATO mission . The second resolution, which was introduced by Rep. Tom Rooney, R-Fla., also failed, by a vote of 180-238. Eighty-nine Republicans joined 149 Democrats in defeating the measure. Only 144 Republicans and 36 Democrats voted for it. Rep. Steve Womack, R-Ark., was in the chair when the vote was called at 2:00 p.m.
Two candidates seeking the Republican nomination for president in 2012, Reps. Ron Paul, R-Texas, and Michele Bachmann, R-Minn., voted against authorization. Both contenders also voted against the Rooney Resolution. The resolution would have specifically limited "the use of funds appropriated to the Department of Defense for United States Armed Forces in support of North Atlantic Treaty Organization Operation Unified Protector with respect to Libya, unless otherwise specifically authorized by law." Exceptions to the Rooney Resolution ruled that the limitation on funds would not apply with respect to search and rescue; intelligence, surveillance, and reconnaissance; aerial refueling; and operational planning. Secretary of State Hillary Clinton ultimately took the votes as an endorsement of the Obama administration's campaign. "I am pleased that a very important statement was made today by the House on a bipartisan basis that recognizes the need for us to continue on this important mission," Clinton told reporters. "We would have preferred a different outcome on the Hastings resolution but ultimately we are gratified that the House has decisively rejected efforts to limit funding for the Libyan mission." Congressional aides said support dwindled for the measure as lawmakers grew concerned that all the exceptions inherently authorized the president to conduct operations there, but that ultimately the message was clear to the president. "Reflecting the sentiment of the American people, the House overwhelmingly voted against authorizing the operations in Libya today, and a second bill going even further than that by restricting funds received hundreds of votes," Michael Steel, press secretary for House Speaker John Boehner of Ohio, said. "Taken together, these votes illustrate the unfortunate failure of the White House to make the case for this operation to the American people and the Congress." This measure would have effectively ended all drone strikes and airstrikes by U.S. aircraft. When the House returns from recess after Independence Day, Rep. Dennis Kucinich, D-Ohio, who has worked endlessly for the past few months to end U.S. armed forces in Libya, has introduced an amendment to the FY2012 Defense Appropriations bill that would completely defund the operation for FY2012. The Obama administration, which initially was reluctant to get involved in the conflict, is pushing back and making the case to Congress why American involvement in Libya is important. Clinton Thursday met with members of the House Democratic Caucus to urge them to vote against defunding the operation. "She made the case that with [Libyan leader Moammar Gadhafi] on the ropes, the Libyan opposition gaining politically and militarily, now is not the time to change course," a senior State Department official told ABC News in an email Thursday night. "Our NATO Allies, regional states, the UNSC and Arab league are unified in standing up to [Gadhafi's] brutal regime, and we must not break faith with them. "She also made the case that we need to stand by the Libyan people during this difficult period and see the mission through. She said our game plan is on track, we are executing it, and it is having results. Day by day our collective effort is bringing us closer to ultimate goal of post-Gadhafi Libya. "She also pointed out that withdrawing from the mission at this critical juncture would have a real impact both within Libya and in the region as a whole, sending a message that would demoralize Arab democrats and embolden autocrats," the official added. It appears the most stalwart of House opponents was not swayed by Clinton's presentation. "The secretary was there to make the case on behalf of the administration on why they want to continue to the war," Rep. Kucinich told the New York Times after the meeting. "She was emphatic and detailed, but I didn't hear anything that would change anyone's position, pro or con." Perhaps boosting the administration's case, the Wall Street Journal today reported, citing U.S. intelligence sources, that Gadhafi is considering fleeing Tripoli as NATO bombs rain down on the capital. Such reports have been percolating in recent weeks, with Libyan opposition figures saying Gadhafi's allies have floated deals that would end the fighting and remove the longtime strongman from power. 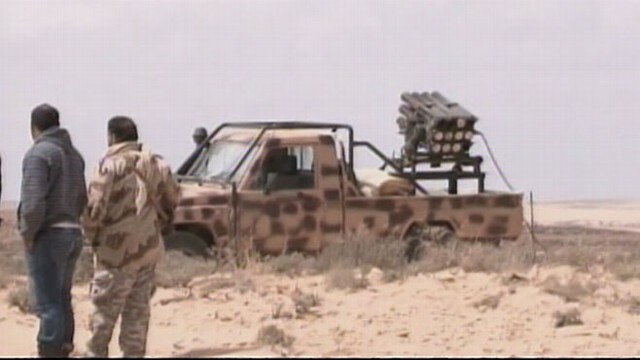 After providing much of the initial firepower that took out Gadhafi's air defenses when the bombing began in March, the United States has scaled back its airstrikes, leaving that task to other allied aircraft, and limited its military role in Libya to critical logistics and refueling missions.